"...on the eve of the departure of VP 872 for release to reserve status CJTF8 wishes to comment that tlie 'Weekend Warriors' of Alameda proved themselves a credit to the Naval Service. Please pass to all hands a 'Well Done' for their outstanding contribution the past few months." 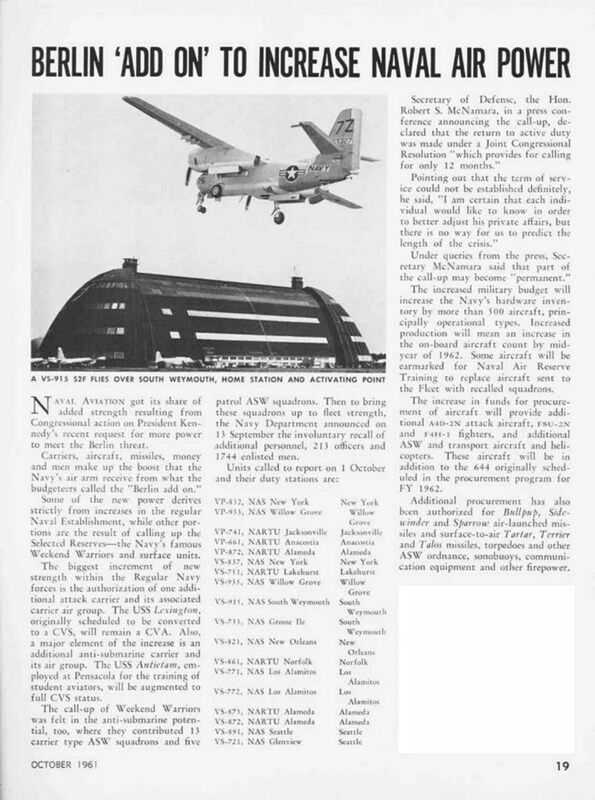 "...the outstanding degree of professional airmanship demonstrated bv VP-872 is particularly noteworthy." "Patrol Squadron 872 can be justifiably proud of the exceptional record of achievements during this deployment. Especially noteworthy was the three thousand flight hours flown since mid-March without missing a single commitment." 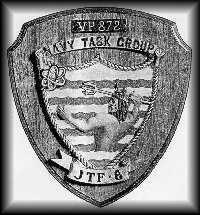 "All members of VP-872 can be proud of their record with JTF8. Your efforts and hours of hard work were evident in the results of all assignments given you." "Noted with pleasure the outstanding performance of VP 872 in support of JTF8 Dominic operations." ...note with pleasure the comments of your superiors on your performance during deployment. Lpon reporting to me for active duty you immediately went to work to be ready for anv assignment. The manner in which you accomplished your varied and difficult tasks with JTF8 attests to the success of vour preparations and determination." "The Naval Air Reserve Command is proud of the job vou have done and to welcome you back upon your deactivation." "Your record of meeting all operational commitments. and surpassing the 1000-hour-mark in one month with an ll-plane squadron is one of which vour officers and men can be proud. This is particularly impressive considering the operations were conducted from an advanced type base." "CNATRA notes with pride the outstanding performance of VP-872. 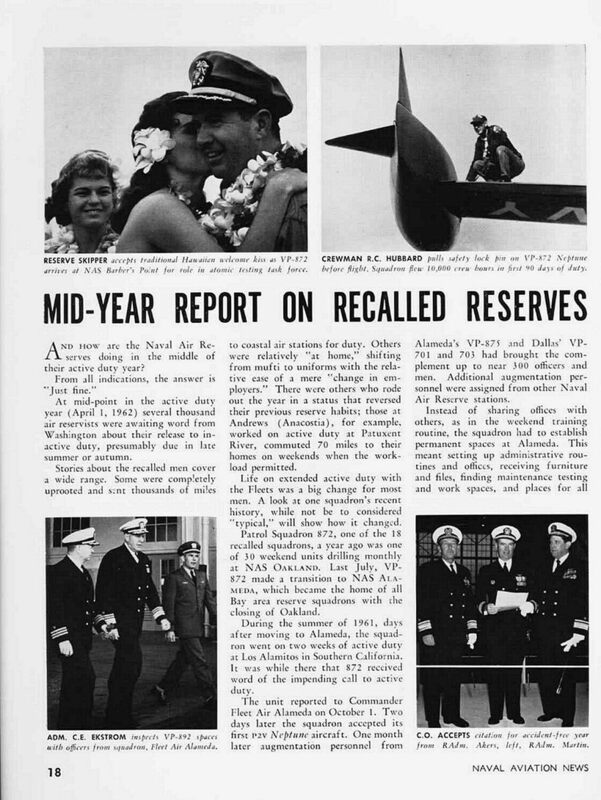 VP-872 personnel notified of impending recall to active duty via newspapers, radio and TV. 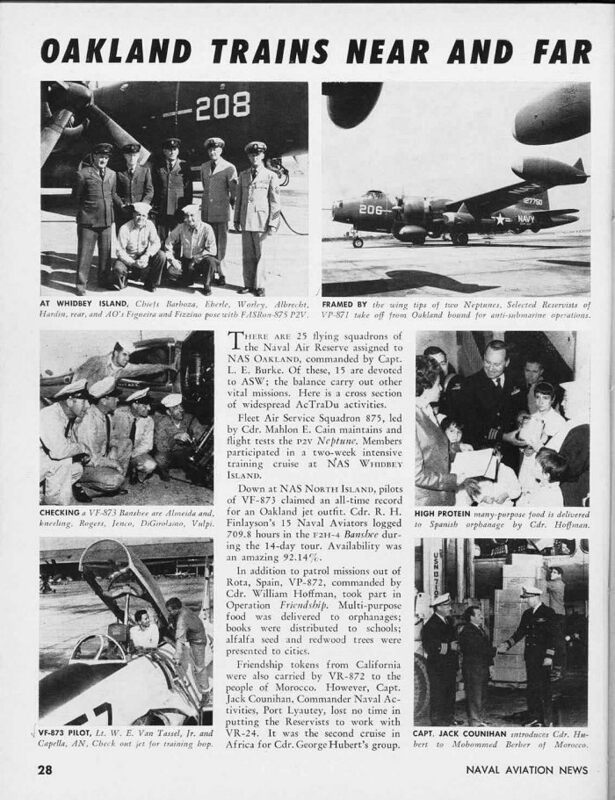 VP-872 personnel report to NAS Alameda for one year's active duty. 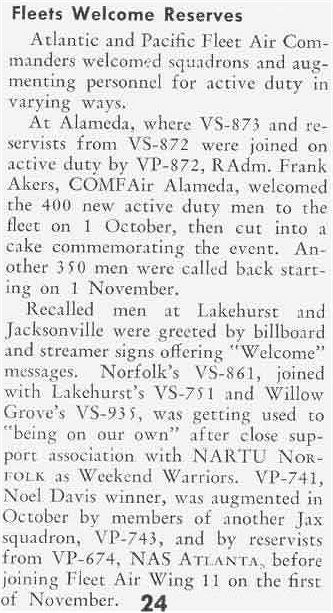 Accept first P2V-5F from NARTU NAS Alameda. Squadron flies first ASW barrier patrol from NAS Alameda. Squadron receives first tool through reffular supply channels. Squadron is brought up to full strength, augmented bv personnel from VP-701 and VP-703 of NAS Dallas, Texas and VP-875 of NARTT Alameda. along with other individual reservists and TARS from NAS Dallas, Texas and NARTU Alameda. Majority of Texans say "Merry Christmas. Y'all!" and go on leave. 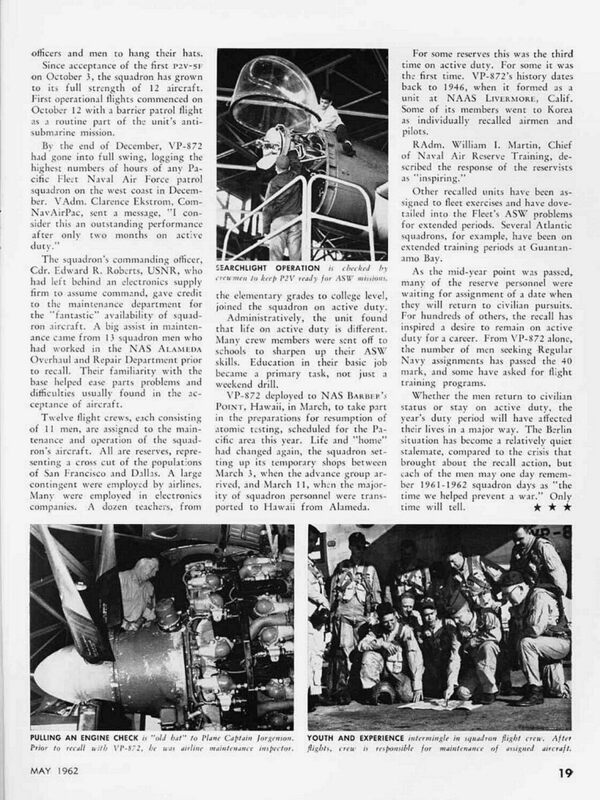 Squadron is awarded 1961 Naval Air Reserve Safety Citation from RADM. Frank Akers. Commander Fleet Air Alameda. Twelve squadron enlisted men are first to take advantage of Nav)'s offer to transfer into the regular Navy. An official "WELL DONE" is received by the squadron from Commander Naval Air Forces Pacific Fleet for flying the highest number of patrol squadron flight hours on the West Coast for the month of December. 1650 hours. Happy Valentine's Day! Squadron receives word of deployment to MIDPAC. Advance party arrives at NAS Barbers' Point. Remainder of squadron and P2Vs given "swinging" welcome upon arrival to NAS Barbers' Point. Squadron sets NAS Barbers' Point record for longest delay of launch of back-up plane-4 hours 3 i minutes. Advance party departs for MIDPAC. NAS Barbers' Point record set by squadron for fastest launch of back-up plane. Aircraft airborne in 23 minute? after word was received that first P2V was aborting. Squadron has luau at Waikiki. Poi voted most unpopular food of the year. Flight Alpha arrives at MIDPAC to build chiefs' club and landscape BOQ. Squadron completes MIDPAC deployment. Now under the operational command of Joint Task Force 8. participating in Project Dominic. Crew #6 finds derelict Peruvian freighter. SS Iquitos. Squadron launches four back-ups in one night. Otherwise the evening is without incident. according to the World Duty Officer. Squadron flew 817 hours during the month of April. Squadron flew 1,057 hours during the month of May. Squadron returns to NAS Barbers' Point. Majority of squadron and P2Vs again deploy to MIDPAC. Squadron returns to Barbers' Point and prepares to invade mainland with orchid leis and Tikki Gods. Alpha flight departs for NAS Alameda. Squadron gathers for "Welcome Home" ceremonies as P2Vs arrive at NAS Alameda. Majority of Texans head for Dallas to he released. Remainder of squadron simply disappears. Squadron flew 1,197 hours during the month of June. VP-872 deactivated in ceremonies presided over by ADM. Chester W. Nimitz. VP-872 has flown over 4.900 hours or more than 750.000 miles and has maintained a perfect safety record.